Wisdom of Life. : Honesty might not be the best policy. Not all the time efficiency, knowledge and honesty are practical in life. In the Western World, perhaps it works but with Asian it's not acceptable most of the time. In the USA, if a motorist has a problem with his car which rattles while driving, he would be too happy to pay a mechanic who can detect and repair his car sooner. The cause can be a little nut that loosen, which can easily be tightened but the motorist will be too happy to pay, even with a higher charges. Because he appreciates the mechanic efficiency, knowledge and honesty on his work. By doing so, the mechanic solves his problem faster and motorist has more time for other productive tasks. However over in Malaysia, the same scenarios could be different. Motorist sent his car to the workshop where mechanic located the loosen nut too. Instead of telling the truth, he said, "Oh! Big problem! It would take a while for us to check. Please come back later of the day and we would try our best." The minute the motorist left, the nut was tightened. Later of the day when he returned, mechanic smilingly claimed, "Friend, it was a big big problem but we manage to solve all the necessary now. For the heavy repair, it is only RM100 charges." The car owner paid happily without question cause he appreciated, the inefficiency, knowledge and no honesty principle of our kind. If you don't believe me, ask yourself, "Am I like that?" 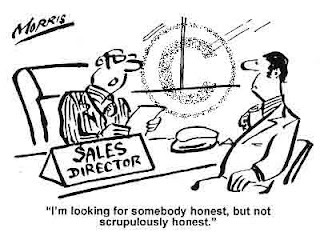 Conclusion; "Honesty might not be the best policy at times." i was taught honesty is the best policy.however,if by being brutally honest, someone is getting hurt without benefiting from the pain.... than such honesty might be too cruel.